I love you website and wondered if you can assist me. I am trying to find information about my Grand father, see below. I found his brother, William's death listed in newspaper (Frickley Colliery 1931 - gassed) but cannot find anything about how my grandfather George got injured. I have checked the online register of mining accidents but found no mention of George Evans (he had no middle name). He was treated by a Cancer Specialist at Sheffield Hospital before his death on 23rd October in 1942. The family lived at 51 Westfield Lane, South Elmsall at the time of his death. I have never seen a photo of him and am trying find the details of the mining accident which lead to his death." 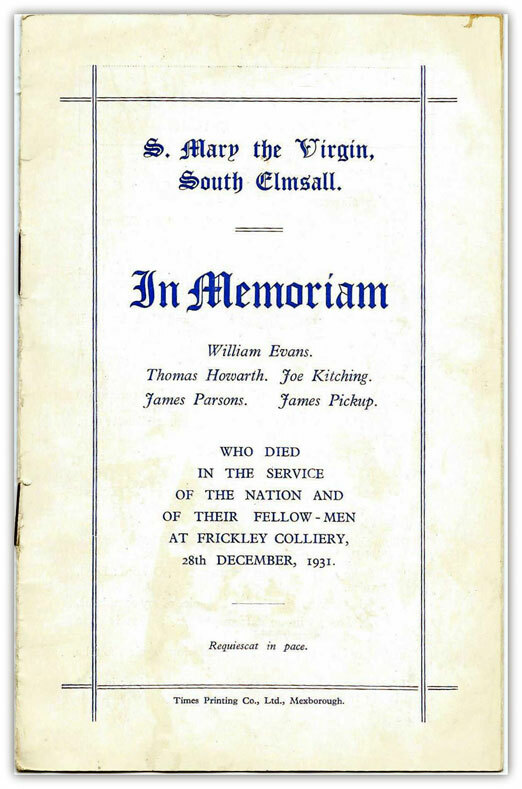 Whilst searching the internet for information about my Great Grandfather William Evans (who was a deputy killed in a gas explosion at Frickley Colliery on 28 Dec 1931) I came across a question on your website from John Evans re George Evans who he said was William Evans' brother.? 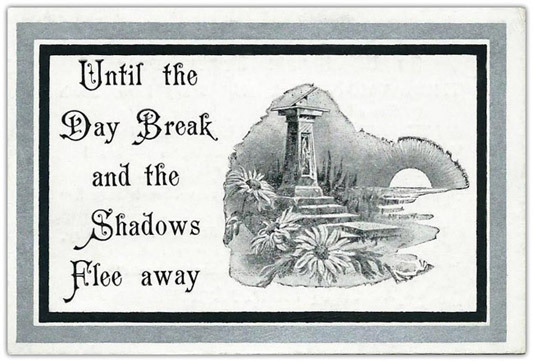 As I haven't managed to find any record of George Evans, born 1878, during my family research I wondered if it was possible for me to contact John Evans, via you, to try to get my family tree a bit further progressed. I drew a blank last time due to them having moved up to Frickley from Shropshire and Ruabon (North Wales).? I have started to go through a couple of small boxes of old family photos etc?which I saved when my Grandmother died and have come across the attached.? 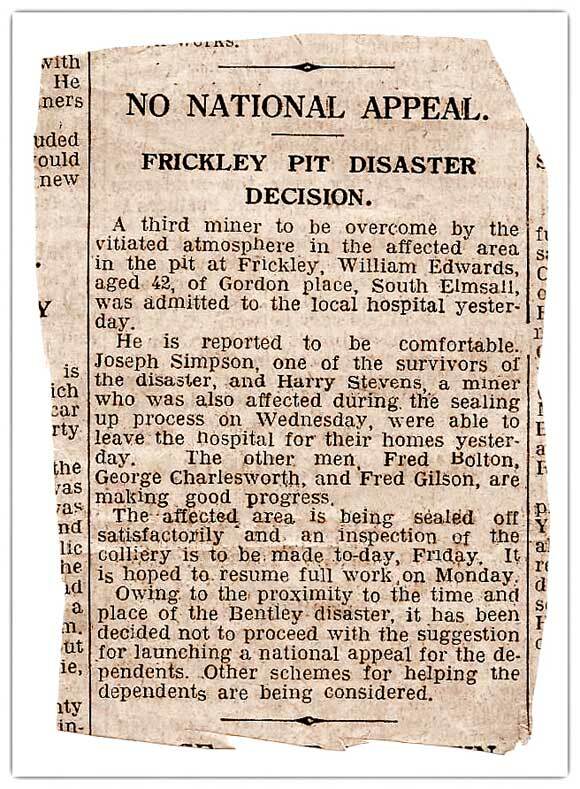 A newspaper cutting re the gas explosion at Frickley in 1931. The source isn't marked but I don't think it is a local paper as the reverse has steel prices quoted on it. 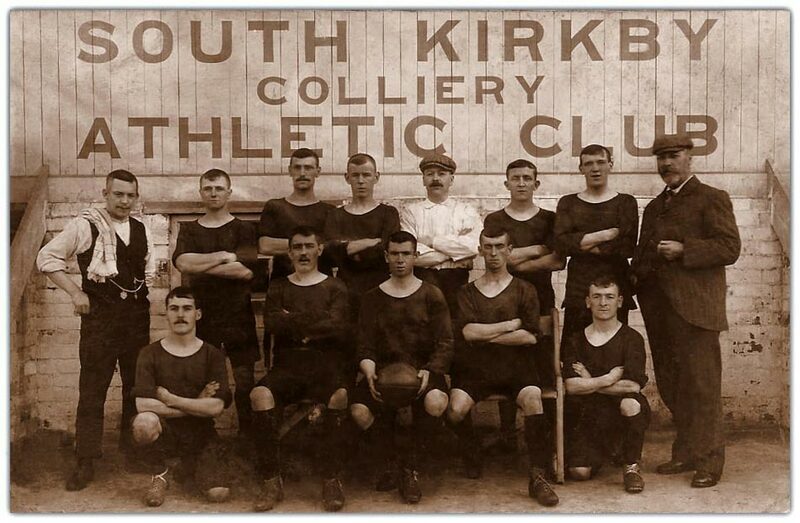 A photo of South Kirkby Colliery Athletic Club which is in the form of a postcard, unfortunately there is no date and I don't know who are on the photo but I presume an ancestor of mine is included! 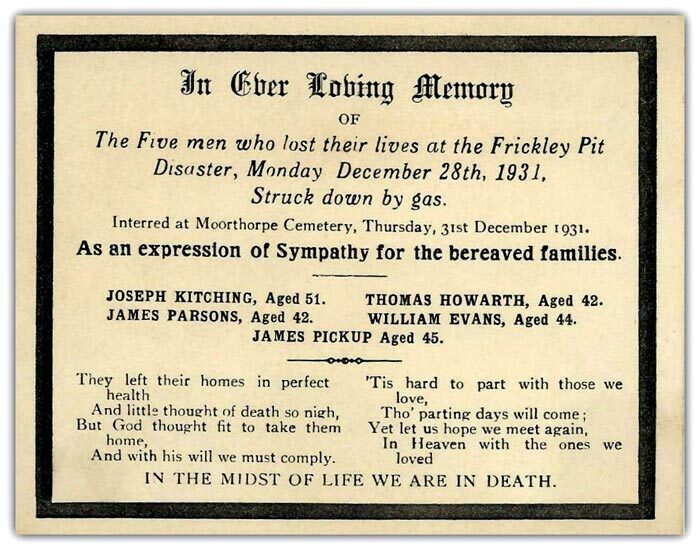 28 December 1931 – Five colliery deputies died at Frickley Colliery, Yorkshire, after they walked into a pocket of gas. They were part of a party of seven deputies and an overman sent down the pit to carry out a safety inspection following the Christmas shutdown. 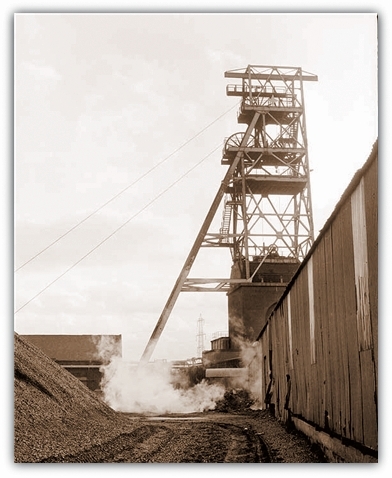 At the time the colliery would employ between 3,000 and 3,500 men and boys but the pit had not re-opened and only 20 men were underground at the time. The first sod was cut on 23 April 1903 of shafts No.1 and No.2 and the Barnsley Bed was hit on 23 May 1905 at a depth of 606 m. Sumps were established at a depth of 624 m in the Dunsil seam. Both shafts were 7 m in diameter and brick lined throughout. South Elmsall Colliery situated in the same curtilage as Frickley, was sunk during 1920–23 reaching the Shafton seam at a depth of 218 m. This No.3 shaft was 4.26 m in diameter and brick lined throughout. 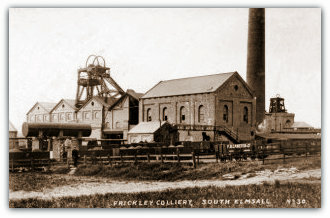 Despite being located in South Elmsall, the colliery was sunk within the land of Frickley Hall, part of the small Hamlet of Frickley, hence the Frickley name. The Carlton Main Colliery Company was a model employer with strong views on the welfare of its workers. Its Welfare schemes included a hospital, maternity home, medical service, recreation ground, swimming baths and miners institute. 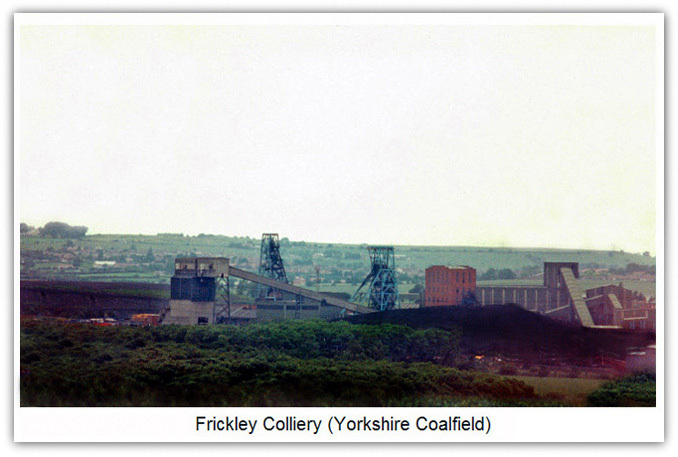 The colliery saw the birth of Frickley Colliery F.C. later Frickley Athletic F.C. in 1910. The Barnsley seam was worked until 1934 by hand-got tub stalls when mechanical conveying was introduced at the coal face. During the next three years the installation of face conveyors was completed almost throughout the whole pit. The total output was obtained from the Barnsley seam until 1942 when the Dunsil seam was entered in a small area to the south of the shaft piller. Since 1942 further access to the Dunsil has been obtained by means of drifts from the Barnsley level and two further areas to the West and East have been entered to work the Dunsil seam. Coal winding remains at the original Barnsley level. In 1951 the first prop free, front face with an armoured conveyor installation started up on 101's unit in the East Dunsil area. In February 1955 it became necessary to start off a face in the East Dunsil on the end cleat of coal and it was considered that such conditions would lend themselves to the use of an Anderton Disc Shearer machine working in conjunction with an armoured conveyor, friction type props and link bar supports.